Hell is Just the Opposite is a audio installation that deals with issues of acoustic transmission, reception and interaction by reversing its perception. It is an installation based in part from the conceptual multi-channel audio research called Acoustic Mapping Process (AMP) 1993. This process consists of any set of listening or recording devices that listen to an acoustic space using a minimum of four directions simultaneously and then rebroadcasts or re-presents this filtered sound space to the listener. For the installation Hell is Just the Opposite, the exhibition gallery walls are filled with a series of ready-made found objects selected from rural Saskatchewan. These objects are capable of producing a range of percussive sounds when struck with a light wooden mallet by the public. In addition, mechanical clocks (faced with children’s loonie tunes images) are mounted on each of the 4 walls. In the centre of the exhibition space are specially-designed 4-channel array of microphones listening to the gallery space 4 directions simultaneously. 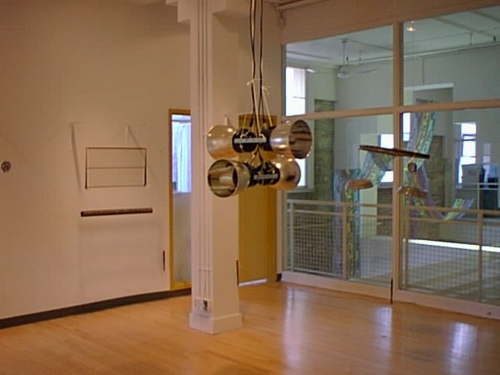 When the public enters the gallery space it is invited to wear a set of wireless stereo headphones which presents the sound of the gallery space from the point of view of the central microphone array. 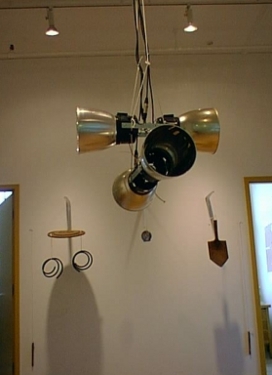 The public is invited to percussively explore the sound of the ready-mades hung from the walls of the gallery. 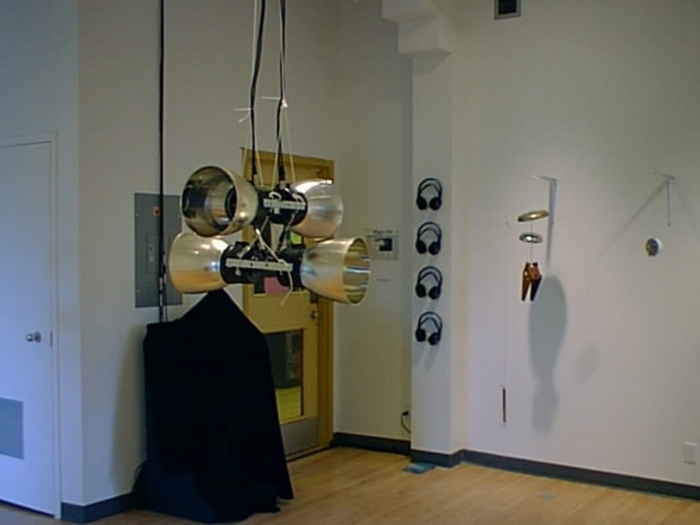 Depending on the direction the public is standing in the gallery when interacting, the audio field in the headphones from the microphone array may be up to 359 degrees out of alignment from reality, with 180 degrees being completely backwards or opposite to the gallery space, similar to a disconcerting mirror reflection. This playful perceptual trick for the ears enhances the listening experience for the public by reversing real-time directional sound space.